Why buy a Chevy Spark when you could buy this used Dodge Viper for less? Usually, it’s because “cheap supercar” really means “immediate and immense repair bills.” But if you get lucky, know what you’re doing and where to scrounge up parts, you might be able to squeeze some decent power out of a fifteen-year-old V10 yourself. I too am hopelessly seduced by the idea that maybe someday, some way, I might get a freak deal on one of the unobtainable automobiles I have toys of on my desk. Deep down I know it’s not going to happen. But stories like this dude finding a $10,000 Dodge Viper down in Florida get me wound up all over again. Every time. When YouTuber Rob Ferretti showed us this “beater Viper” back in October it had a ratty interior, scuff marks all over the trim and body and much more significant mechanical ailments. As he reiterates in his update, the V10 was down on cylinders and one of the catalytic converters was overheating. 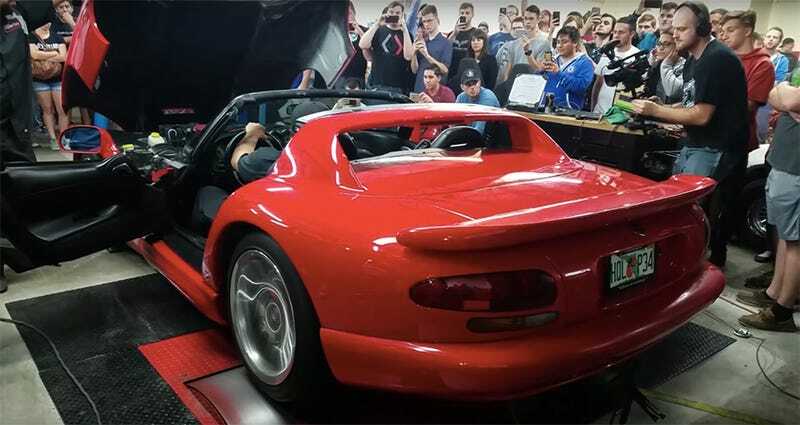 Since then the car’s owner apparently replaced the heads, fitted a straight-pipe exhaust system and made a few more upgrades that raised the car’s estimated “value” to $16,000. And seemed to wake it up pretty well. A 2001 RT/10 Viper’s 8.0-liter V10 was rated to 450 horsepower and 490 lb-ft of torque. This one made three pulls on a dyno and laid down: 419 hp/454 lb-ft, 417 hp/444 lb-ft and 421 hp/451 lb-ft. So I guess we can give it max’es of 421 hp and 454 lb-ft at the rear wheels. Now the straight pipes will be making up for some of the energy lost elsewhere, but that still seems like a solid output for fifteen-year-old $16,000 car. As you can see in Ferretti’s video, the car still looks like a hand-me-down jalopy up close. But at the right angles, with the right shine, it’s an impressive looking project so far! 'Buy it used' they said. 'It'll be cheap' they said.